Sounds like a good action adventure movie. 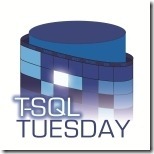 The theme this month on TSQL Tuesday, thanks to our host, Jen McCown (blog|twitter) of SQLawesomesauce, is Resolutions. In particular, Techie Resolutions. I have to do this because Jen just received her MVP award, in case you’ve been under a rock since last week. I’m not a resolutions kind of guy. I tend to make plans. The plans might start on January 1st, or they might start as soon as they lawyers are done making up the contract. I’m not hung up on schedules except as they relate to due dates. For example, when submissions are due for the PASS Summit or something along those lines, then I’m date driven. In other words, I don’t sit down New Year’s Day or New Year’s Eve or whenever it is that you’re supposed to make resolutions, and come up with some new list of stuff that, this year, I’ll do for sure. Instead, I’m working on my plans, and working my plans, all year long. This year is a little different. It just so happens that some changes are headed my way (remember those lawyers) and it’s roughly coinciding with the start of the new year (although not as much as I had hoped). So I’m making some pretty serious resolutions, or as I like to think of them, plans, for the coming year. My focus this year is going to shift, a bit, not a lot, but it’s going to require a lot more out of me. So I am resolved to work on three things, technical or related, this year. First up, I’m finally starting to set up a serious home office where I can do more extensive experiments, tests, development, in an environment that I can isolate and control. But, this means that I’ve got to expand my skill set a bit and learn more about the OS, and virtual machines, and some of that other low-level stuff that I’ve largely been able to ignore because I work for a large company filled with guys who live for that stuff, so I’ve never had to. But I’m learning it now. And you know what? It’s a challenge. Getting virtual machines to communicate to each other and the host was a flipping bear. I never got it to work on Virtual PC, but Virtual Box, thanks to my pleas on twitter, came to the rescue (and how painful was it to install Oracle stuff on my pretty new machine). But I’ve got a lot more to learn in that space. Next, I’m going to spend a lot more time drilling down on a particular tool set. It’s one I’m already familiar with, but I’m going to get even more intimate. I plan to learn this software forward and backward because I want to be able to use it well, and, more importantly, teach others to use it well. This resolution isn’t so much of a stretch because it’s the kind of thing I like to do anyway. Finally, I’m going to write more. I plan to pump up the production line and start churning out articles and blog posts. I’m also going to rewrite my book on execution plans, because, frankly, it needs it. Then, I’m going to start working on the Tuning Distilled book, getting it ready for Denali, so that I can release it as close to the release of Denali as possible (which could mean I have another year or so to work on it, but I doubt it). In short, my little fingers are going to fall off from typing so much. I’m actually extremely excited by this. I enjoy writing. I even enjoy the process of writing books (and you know how I try to scare you guys away from that). This will actually be the hard resolution to deliver on, but we’ll see how it goes. That’s it. Three rather vague resolutions coming up for me for the new year. Stretching out the skill set, trying to deliver more, in general, I’d say these are somewhat worthy goals, at least for me. Man, I just bought that book on execution plans. Guess the 2nd edition just went onto the wish list! It’ll be quite a few months before the 2nd comes out, so you can read that one & let me know what else I need to fix.